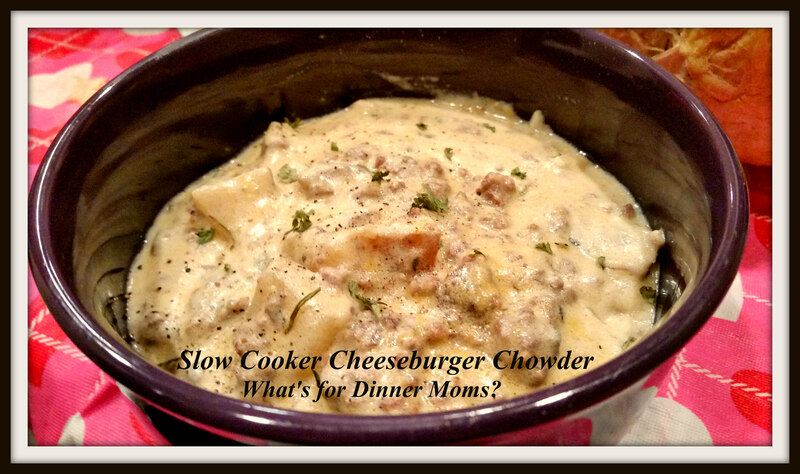 Slow Cooker Cheeseburger Chowder – What's for Dinner Moms? Things are crazy in our house right now. My meal planning has gone down hill but I am getting it back together. Generally I have a month plan to follow with a few extra dishes on the side for nights I really don’t want to cook or something comes up that I just need that 20 minute meal on the table right now. But, I am at three days of planning currently. That’s what happens in real life. We adjust and make it work. If meal planning for a week is too overwhelming try two or three days. It doesn’t have to be fancy but just something you know when you get home that you can make fairly simply and quickly or that is in the slow cooker waiting for you. Tonight I was thankful for my slow cooker and my bread maker. I debated for quite a while what to call this chowder. It really isn’t cheeseburger but then again do I call it cheesy potato, ground beef chowder? Then I realized you can customize the chowder by the bowl or entire dish. Add a few teaspoons of stone ground mustard, or a tablespoon or two of pickle relish, add a drizzle of barbecue sauce over the top or even some bacon and onions. It is up to you. Pretty much like your cheeseburgers. This was a really good soul warming, stick to your ribs, kind of meal. With the new snow on the ground it was perfect with a loaf of warm bread fresh from my bread maker. What we like is you can customize it by the bowl by adding what you may normally like on your cheeseburgers as a stir-in or a topping. I was wishing for a few french fried onions on mine last night but will have to wait until I get to the grocery store for that. This is a good meal when you have a bit of extra time in the evening as it takes a bit of preparation at the end before serving. additional items you may wish to stir in or garnish with – stone ground mustard, barbecue sauce, bacon, freshly chopped onions, jalapeno, etc…. Place diced potatoes, onion and chicken stock in the bottom of your slow cooker. Cook on low for 6 to 8 hours until potatoes are softened or 3 to 4 hours on high. About 45 minutes before serving time cook ground beef in a skillet over medium high heat. Break the meat into small pieces with a spoon as it cooks. Once fully cooked use a slotted spoon to remove the ground beef to the slow cooker leaving behind any rendered fat. Drain fat off pan and wipe with a paper towel. Melt butter in skillet over medium heat. Once butter is fully melted sprinkle flour over the butter and stir to make a paste. Allow to cook for 2-3 minutes until it starts to turn a light brown. Slowly add half and half as you whisk to avoid clumps of flour. Cook, stirring constantly, over medium-low heat until the mixture thickens and coats the spoon as you lift it. This may take up to 10-12 minutes. Pour the sauce over the potatoes and beef in the slow cooker and add cheese. Stir well and allow cheese to melt. At this point taste and add salt and pepper as needed. You may also add mustard, garlic powder, or onion powder as desired. Next Post Leftover Corned Beef? Here are 5 Recipes to Try! Well whatever you call this it sure looks good! This looks like a meal you really can’t go wrong with. Thanks for sharing.